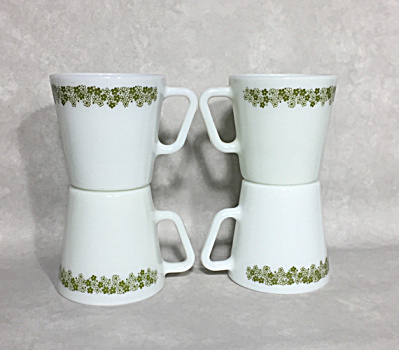 The Spring Blossom Green pattern made its debut in 1972 as part of the "Pyrex Compatibles" to match the Corelle Dinnerware pattern and was designed by Sara Balbach. The elements of the design are highly stylized: flowers in avocado green and white outlined in avocado green with green dots and white dots outlined in avocado green. This set of four Diagonal handle #1410 Coffee Mugs has the Butterfly Gold design around the top. They are in excellent vintage condition. They are great for coffee, tea, hot chocolate or soup!